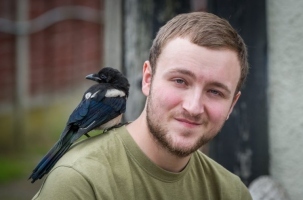 Peter Redwood-Smith, 21, became a devoted adoptive father to the black and white bird named Pica after saving it when it fell out of its nest. He has hand reared and nurtured the tiny chick he named Pica, and the birds now happily sits on Peter's shoulder throughout the day. The bird is capable of flying away now and can come and go as he pleases - but instead has chosen to stay close to his friend's side. Peter, from Rayleigh, Essex, said: "Pica has free roam and he follows me from room-to-room. "He's started to pick up a few little tricks now and he will try to steal things. "He will run off with a number of things, he takes money quite a lot like five pound notes and coins. "He's even tried to run off with a pair of scissors and will hide things around the shop. "But when I call him he comes to me and he tries to speak to me as well. "Apparently they are very clever and have the intelligence of a five-year-old." Peter has even set up a YouTube channel and Facebook page where his fans can keep up to date with the pair's latest adventures. He rescued the bird almost six weeks ago when it had no tail feathers and was so weak it could barely stand. Peter feeds him a number of different things including duck, chicken, pheasant, meal worms, crickets and locusts. The shop owner added: "I found him right outside my shop and brought him in and said ‘here's a present'. "There was a cat just outside and Pica was so tiny he couldn't have outrun the cat. "It's very lucky he was saved just in time otherwise he would almost certainly have met an untimely end. "I have hand-raised Pica and looked after him. I had to feed him by hand so that he could build up his strength. "I am just trying to give him the best life I can, he's a lovely little bird. He's very friendly." Pica has flown away twice but has returned to his adoptive dad not long afterwards. He goes outside for up to two hours a day where he forages for food such as earth worms, but mainly he enjoys sitting on Peter's shoulder. Magpies are known to be clever and inquisitive garden birds which pick up all sorts of things to explore them - and they can even recognise their own reflection in a mirror. But the birds are also a nuisance to other garden birds as they eat songbird eggs and chicks. Their natural diet is quite broad as they eat insects, mice and other small rodents, as well as berries and fruits.